New Zealand workers were among the first in the world to claim the right to an eight-hour day. As early as 1840 the carpenter Samuel Parnell famously won an eight-hour day in Wellington. The provision was soon extended to other centres, but it was a custom, not a legal entitlement, and only applied to some groups of workers. 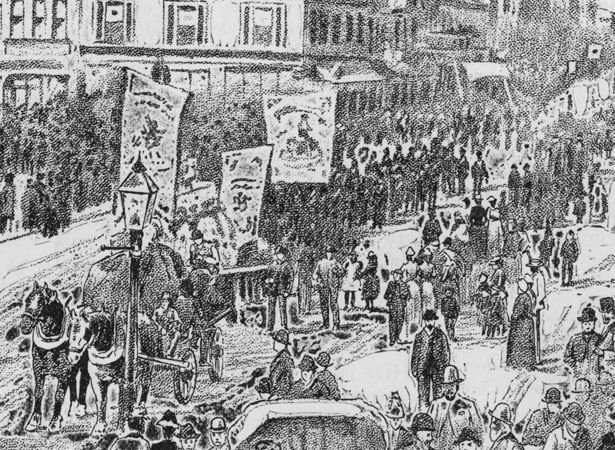 The establishment of Labour Day reflected the growing influence of New Zealand's trade union movement in the 1880s and its efforts to improve employment conditions for all workers. Labour Day was first celebrated in New Zealand on 28 October 1890, marking 50 years since Parnell's achievement and the first anniversary of the formation of the Maritime Council, an umbrella organisation of transport and mining unions, in 1889. The event was held during the dying days of the ill-fated trans-Tasman Maritime Strike, and several thousand trade union members and supporters attended parades in the main centres; a highlight of the Wellington event was an appearance by the elderly Parnell himself. Government employees were given the day off to attend the parades. We have 7 biographies, 6 articles, related to First Labour Day celebrations.